The Jewish presence in the Netherlands [Holland] began, and nearly ended, in tragedy: The first Jews came after being expelled from Spain, and the huge community was decimated 350 years later by the Holocaust. In between, Dutch Jews contributed to one of the most prosperous and enlightened eras in the history of the Netherlands. The history of Jews in the Netherlands was different than their experience in any other country. 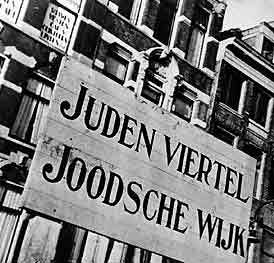 There was a concerted effort by Jewish leaders during the Holocaust to perserve Dutch Judaism, which was still decimated by deportations. Today, the Jewish community of the Netherlands numbers approximately 29,900. Jews in the "Golden Age"
It is likely that the earliest Jews arrived in the “Low Countries,” present day Belgium and the Netherlands, during the Roman conquest early in the common era. Little is known about these early settlers, other than the fact that they were not very numerous. For some time, the Jewish presence consisted of, at most, small isolated communities and scattered families. Reliable documentary evidence dates only from the 1100s; for several centuries, the record reflects that the Jews were persecuted and expelled on a regular basis. Early sources from the 11th and 12th centuries mention official debates or Disputationes between Christians and Jews, in which attempts were made to convince the Jews of the truth of Christianity and to try to convert them. It is not certain whether the Jews were residents in the area or whether they were just passing through. As of the 13th century, there are sources which indicate that Jews were living in the areas of Brabant and Limburg, mainly in cities such as Brussels, Leuven, Tienen, and Maastricht. Sources from the 14th century also mention Jewish residents in the cities of Antwerp and Mechelen and in the northern region of Geldern. Between 1347 and 1351, the entire area covering Europe was hit by the plague or Black Death and this led to a new theme in medieval anti-Semitic rhetoric. The Jews were held responsible for the epidemic and for the way it was rapidly spreading, because presumably they were the ones who had poisoned the water of the springs used by the Christians. Various medieval chronicles mention this, e.g., those of Radalphus de Rivo (c. 1403) of Tongeren, who wrote about how the Jews were murdered in the Brabant region and in the city of Zwolle because they were accused of spreading the Black Death. This accusation was added to the other traditional blood libels against the Jews, such as piercing the Host used for communion and using Christian children as an offering during Passover. For this reason local Jewish communities were often murdered in part or entirely or exiled. Thus, in May 1370, six Jews were burned at the stake in Brussels because they were accused of theft and of desecrating the Holy Sacrament. In addition to these drastic measures, traces can also be found of abusing and insulting Jews, e.g., in the cities of Zutphen, Deventer, and Utrecht, for allegedly desecrating the Host. Rioters massacred the majority of the Jews in the region and expelled those who survived. For the next two hundred years, the number of Jews in the area was likely close to zero. By the time the Dutch principalities rebelled against Spain late in the sixteenth century to form the United Provinces of the Netherlands, there were probably no Jews left. Interestingly, while the Jews were numerically inconsequential in the region during medieval times, their place in the Low Countries' culture was much more prominent. A significant portion of the surviving literature and poetry from that era is rife with anti-Semitic references, and the contemporary Christian legends emphasize the perfidy of the Jews, and their role in the death of Jesus. From the 15th century, Jews also resided in the Northern Netherlands. Their most important occupation was moneylending, making them dependent on the economies of the cities. In this way, Nijmegen became an important financial marketplace where a great many of Jewish families came to settle. Nonetheless, Jews continued to choose the large cities in the Southern Netherlands as for their home base. In the 16th century the city of Antwerp came to be a very important location for Jewish tradesmen and moneylenders because of its flourishing economy. This also turned it into a refuge for a number of Marranos who had been expelled from Spain and Portugal by the Inquisition after 1492. Jewish bankers usually settled there using a Christian pseudonym. Francisco Mendes, born into a distinguished family of bankers, opened a branch in Antwerp that was one of the largest banks in Europe. After his death in 1536 it was run by his wife Gracia Nasi. The flourishing Jewish trade in Antwerp ended, however, when The Netherlands were divided during the reign of king Philip II and, by the end of the century, many Jews took refuge in the Northern Netherlands, especially in Amsterdam where they formed a community. Amsterdam, however, did not recognize religions other than Protestantism. The community was discovered, and its leaders arrested, in 1603. As a result, some of the newly-acknowledged Jews moved to the towns of Alkmaar, Rotterdam, and Haarlem, which extended them protective charters. The majority, however, remained in Amsterdam, and even founded a second community there in 1608. 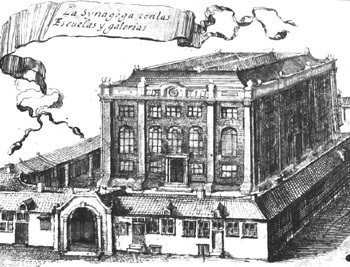 A drawing of the “Snoga” Sephardi synagogue. The Protestant Church, the official religion of the state, was furious that the Jews were not being repressed, but secular authorities were not eager to punish the Jews, who had become important traders and merchants. To clear up the religious controversy, new statutes regarding religious tolerance were issued in 1619. These new laws left the decisions regarding Jews completely in the hands of individual city rulers. Amsterdam itself declared that Jews were welcome, but not as citizens; they could practice freely, but were somewhat limited in their commercial and political rights. Most cities followed Amsterdam's example, though some cities granted Jews complete rights, and others prohibited Jewish settlement altogether. Thus, the overall status of Jews in the Netherlands remained inconsistent, but was generally in the Jews' favor. In 1620, the first Ashkenazi Jews arrived in Amsterdam, and they formed a community by 1635. The Ashkenazim, who first came from Germany, and later from eastern Europe as well, also settled elsewhere in the Netherlands, particularly Rotterdam and the Hague. The Ashkenazim in the Netherlands soon became superior to the Sephardim in numbers, but, with the exception of a few wealthy Ashkenazi families, they remained inferior socially and economically. Politically, the Jews were for the most part left to their own devices. Their internal affairs were managed by the kehilla, the Jews' semi-autonomous governing body. The Jews judged themselves in bet dins (religious courts), organized their own educational system, and appointed leaders from within their own ranks. This political isolation from the rest of society on the part of the Jews was typical in Europe in this period. In other ways, however, the Netherlands' Jewish community was atypical. While in general, European Jews isolated themselves economically and socially as well as politically, the Jews of the Netherlands enjoyed, as early as the seventeenth century, economic and social integration that the rest of European Jewry would not know for hundreds of years. Professions like medicine became very popular, and Jewish physicians were free to practice even among non-Jews. More importantly, the Jews, particularly the Sephardim, played a large role in the economic expansion that elevated the Netherlands to a world center in the 1600s. The Portugese Jews, with their knowledge of languages and connections to the international trade network of Jews and Marranos, became important in the shipping and trading industries. Several Jews were important shareholders in the East Indies Company, which dominated international trade during the seventeenth and eighteenth centuries. Jews became prominent in other businesses as well, succeeding in the tobacco, sugar refining, and printing industries. Most of all, the diamond industry soon became an almost exclusively Jewish occupation due to their success in it. Because of their economic integration, Jews in the Netherlands eventually united with the greater society to a much larger extent than any other Jewish community in this period. While they continued to be governed by the kehilla, they lived not in a ghetto, but in a Jewish quarter, which the Jews were free to leave and which was frequented by non-Jews – the artist Rembrandt, for example, lived and worked in the Jewish quarter. The anti-Semitic violence that was still prevalent in Germany and eastern Europe was non-existent in the Netherlands. Christian conversions to Judaism, while not common, were not unheard of, and secular scholars were remarkably knowledgeable about Judaism – at a time when most of Europe believed in the blood libel that the Talmud required the blood of a Christian child to be baked into matzah, scholars in Amsterdam were studying the Mishna and the Talmud, and even composing poetry in Hebrew. Reciprocally, some Jewish artists and authors made significant contributions to the flourishing culture of the Dutch Golden Age. This account of the Jews' welfare and integration, however, is subject to a caveat: It was only the Sephardic Jews who were succeeding so well in the Netherlands. The more numerous Ashkenazim were closer to a proletariat than a merchant class. They continued to speak primarily Yiddish, made no lasting contributions to Dutch culture, and, more surprisingly, made few contributions to their own. While many important rabbinical works were published in the Netherlands because of the excellent printing industry, few, if any, were composed there. The Ashkenazi community never produced its own rabbis, and was forced to import them from abroad. Nonetheless, Ashkenazim in the Netherlands did face less persecution than their brethren in the rest of Europe, and were definitely better off in that regard. While the relations between Jews and society were favorable in this period, the internal life of the Jews was far from perfect. Religious divisions led to several schisms that split the often polarized community. The most apparent division was that between the Jews of different nationalities: The Sephardim, the Jews of Portugese origins, maintained a kehilla separate from that of the Ashkenazim. The Ashkenazim themselves were split into two kehillas, a German one and a Polish one, until 1673, when the municipal authority ordered them joined. Further tension resulted from the messianic frenzy that greeted the announcement, in 1665, that Shabbetai Zvi was the messiah, and the subsequent dismay when he converted to Islam. Within both the Ahkenazi and Sephardi communities of Amsterdam, factions loyal to the false messiah battled with those who denounced him as a heretic. In 1713, the ongoing feud resulted in the dismissal of Chief Rabbi Zvi Ashkenazi; by that point, of course, Shabbetai Zvi was long dead. Finally, religious controversy engulfed Amsterdam communities when an increasing number of apostates appeared on the scene. 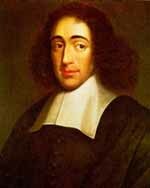 Philosopher Baruch Spinoza, who made important contributions to the Netherlands' culture and scholarship, was excommunicated by all of the leaders of the Amsterdam communities. Uriel da Costa, another famous heretic of the era, was banned as well. On a smaller scale, in 1618, the Sephardi community split over how liberal their community should be, and a group of strictly Orthodox Jews left the kehilla to begin their own. By 1639, however, that rift had been mended. By the mid-eighteenth century, the Netherlands was in a serious decline. As England and France began to catch up to and then surpass the Dutch efforts in trade and shipping, the prosperity that the Netherlands had enjoyed was replaced by economic instability. At the same time, the Enlightenment moved the focus of European culture and scholarship from the Netherlands to France. Matters grew even worse during the Anglo-Dutch war of 1780-1784, and the subsequent popular revolt that resulted in French occupation of the Netherlands – trade dwindled to near zero, and a full-fledged economic crisis affected Jews and non-Jews alike. Consequently, the gap between Sephardi and Ashkenazi Jews steadily narrowed. By the end of the eighteenth century, 54% of the Jewish population survived only on charity, a figure that was roughly the same in both Jewish ethnic groups. Dissatisfied with their economic situation, and influenced by the nearby French revolution, Jews began to lobby for emancipation, and the abolition of the autonomous kehilla. The Batavian Republic, France's puppet government in the Netherlands, officially instituted emancipation on September 2, 1796, but the rights granted to the Jews were rebuffed by a large percentage of the community, who wanted to retain their political separateness. The kehilla split into two factions: One wanted to be emancipated, the other refused. The government sided with the pro-emancipation camp, and so did Napoleon Bonaparte, after he annexed the Netherlands and turned it into the Kingdom of Holland. Members of a Labor Zionist organization prepare for immigration to a kibbutz in Palestine. Despite the technical emancipation, there was no actual change in the situation of the Jews for some time due to the turmoil that was affecting the region as a whole. Napoleon's wars and his eventual defeat made the Netherlands' bad economic situation worse. When, in 1814, a coup again changed the political landscape of the country, the ruler of the new Kingdom of the Netherlands inherited a Jewish population composed of nearly 60% paupers. For the first time, the Sephardim were even worse-off than the Ashkenazim. But improvements were not long in coming now that the Netherlands was once again an independent country. An economic boom benefitted the Jews, who became active in the cotton industry, and returned to the diamond industry. As their prosperity grew, so too did their rights. King William I began to regulate the Jewish community's internal affairs, effectively disbanding the Netherlands kehilla; he instituted compulsory secular education for Jewish children; and he waged a determined battle against Yiddish, which resulted in the Jews' widespread adoption of Dutch. The efforts of the government were aided by those of the Dutch maskilim, who were of course in favor of integration. Soon, Jews infiltrated the professional classes, and many became doctors and lawyers. The new opportunities for Jews were most available in the cities, resulting in the consolidation of nearly all of the Netherlands' Jews in urban locations by the end of the nineteenth century. Not surprisingly, the integration into secular society impacted the religiosity of Dutch Jewry. Orthodoxy lost its influence to Liberalism, and the Jewish population gradually declined, due to conversions, intermarriage, and a low birthrate. As a result, the Jewish nationalist movement never got a foothold in the region, and Zionism never achieved the popularity that it did elsewhere in Europe. From 1939-1940, 34,000 refugees entered the Netherlands as Jews fled Nazi Germany. The Netherlands maintained an open-door policy for immigration. In 1940, at the time of of the German invasion, 140,000 Jews lived in Holland. Jews represented 1.6 percent of the total population. This figure includes refugees from Germany, Austria, and the Protectorate of Bohemia and Moravia. These refugees would be no better off in the Netherlands. A sign reading “Jewish quarter” in German and “Jewish neighborhood” in Dutch. The Germans installed a civil administration under the control of the SS. Arthur Seyss-Inquart was appointed Reich Commissar. He presided over a German administration that included many Austrian-born Nazis. They in turn supervised the Dutch civil service. Soon after the Nazi occupation, the first anti-Jewish laws required all Jews to register themselves as Jews and removed them from their professions, their schools, and their homes. They were also required to register the assets of their businesses. A total of 159,806 persons registered, including 19,561 persons born of mixed marriages. A Jewish council was established in February 1941. On February 25, Dutch workers went on strike to protest the arrest of several hundred Jews who were sent to Buchenwald and Mauthausen. The German authorities and their Dutch collaborators subsequently segregated Jews from the general Dutch population, and imprisoned 15,000 Jews in forced-labor camps. In late 1941, a deportation plan was intacted providing for the removal of the Jews from all the provinces and their concentration in Amsterdam. This phase was launched on January 14, 1942, beginning with the town of Zaandam. The Dutch nationals among the Jews were ordered to move to Amsterdam, while those who were stateless were sent to the Westerbork camp. Other Jews were sent to the Vught camp. By the end of April 1942, Jews were required to wear a yellow Star of David on their clothing. It was difficult to escape from the Netherlands, so most were forced to hide with non-Jews or forge documents with the help of non-Jews. The most famous Dutch Jews who went into hiding were the Franks, who survived for several years hidden in an Amsterdam building before being captured on August 4, 1944, The diary kept by Anne Frank has become the most widely-read account of life during the Holocaust. Ultimately, 25,000-30,000 Jews went into hiding, many with the assistance of the Dutch underground; two-thirds of them survived. Not all of the Dutch were so righteous. In fact, many betrayed Jews for money. An Amsterdam group called the Henneicke Column received 7.5 guldens for every Jew delivered to the Germans, a reward that was later raised to 40 guldens. As many as 9,000 Jews may have been killed as a result of their betrayal. The Nazis deported 12,296 Jews on October 2, 1942. In May 1943, the rate of deportations was accelerated. The last train left Westerbork for Auschwitz on September 3, 1944. During these two years, the 107,000 Jews were deported, mostly to Auschwitz and Sobibor. Only 5,200 survived, less than 25 percent of the Dutch Jewish population before the war. One town, however, actually ended the war with more Jews than it had before the Holocaust. According to research by Herman Van Rens, the Jewish population of Limburg was 800 in 1933, but grew to 2,200 by 1945 as a result of an influx of German refugees before the war and Dutch trying to escape the Nazis following the German invasion. In 1942, when Jews began to be rounded up in Limburg, Jews were usually given 24 hours warning, which allowed many to go into hiding. Elsewhere, the Germans would show up unannounced and take Jews away before they knew what was happening. Approximately 10 percent of Jews who hid in Limburg were caught, but a far higher percentage of Jews in Limburg survived the war than anywhere else in the Netherlands. Because it was such a small town, everyone knew if someone were to betray the Jews so "it carried different social implications in Amsterdam," Rens said. Also, unlike other parts of the Netherlands, it was possible to escape to Belgium through limestone caves that led across the border. An estimated 3,000 Jews went through Limburg on their way to Spain and Switzerland. In April 2005, Holland’s prime minister Jan Peter Balkenende, apologized for his country’s collaboration with the Nazis. The Dutch wartime government “worked on the horrible process whereby Jews were stripped of their rights,” Balkenende said, before he helped mark the 60th anniversary of the liberation of the Westerbork transit camp. In 1946, there were 30,000 Jews in the Netherlands, just 20 percent of the pre-war population; of these, nearly a third were partners in mixed marriages. The population had decreased by several thousand by the mid-1950s, due to emigration and a low birthrate. In fact, the emigration from the Netherlands to Palestine, and later to Israel, surpassed that of any other Western European country. In many ways, the Jews of the Netherlands were better-off after the Holocaust than they had ever been. Relations with non-Jews were friendly, and reparation payments made the Jewish community very wealthy. Traditional Jews, however, were few and far between, and organized community membership dropped due to increased assimilation. A WWII memorial stands in front of the Amsterdam Ashkenazi Synagogue. To the present day, the number of Jews in Amsterdam has held steady at between 25,000 and 30,000. While the total numbers have remained constant, however, levels of observance have increased. Primarily due to the presence of Chabad, there are currently three Jewish schools in Amsterdam, and the number of Jews affiliated with communities has grown over the years. Kosher food is available in Amsterdam, the Hague, and several other cities with Jewish populations. Nonetheless, the majority of Jews are still unaffiliated. The relationship between the Netherlands and Israel has been a mostly friendly one. The Netherlands voted in favor of partition in the UN, and has frequently defended Israel both in the UN and in the European Union. They have provided sporadic military aid to Israel as well. The PLO and, subsequently, the Palestinian Authority, have been granted only limited recognition in the Hague. Koenders also referred to the Israeli blockade of Gaza as collective punishment and condemned the West Bank security barrier as a violation of international law. Groups involved in the BDS movement were hoping that Koenders would take a much harsher stance on Israel and were disappointed. The Centre for Information and Documentation on Israel (CIDI), the main anti-Semitism watchdog organization of the Netherlands, reported in April 2015 that during 2014 the country experienced 171 anti-Semitic incidents, in contrast to 100 incidents during 2013. This reflects a worldwide trend, with anti-Semitic attacks globally increasing in frequency by 40% on average according to a report released by the Kantor Center for the Study of Contemporary European Jewry at Tel Aviv University. Rabbi Benjamin Jacobs, the leader of the Netherlands Jewish community, recommended solving the problem and combatting anti-Semitism through education. The Dutch government issued a travel warning for tourists interested in traveling to Israel in June 2015. The language was perceived as anti-Semitic as the government urged Dutch citizens to avoid “Jewish colonists [who] live in illegal West Bank settlements and organize demonstrations,” when they travel to Israel. Dutch citizens were warned in this online posting that “the colonists are sometimes violent. At times, these colonists throw stones at Palestinians and international vehicles.” The warning advised Dutch citizens to stay away from Gaza, stating that they may become a victim of an Israeli aerial attack, or may be caught in crossfire between radical Islamic groups. During a visit by Israeli officials to the Netherlands in September 2016, an agreement was reached to work jointly on improving water and energy supplies to Gaza. Today, the Jewish quarter, which was destroyed during the Nazi occupation, has been largely abandoned; only the “Snoga,” the Sephardi synagogue remains in use there. Nonetheless, the quarter is still full of monuments and historical sights. The Rembrandthuis (Rembrandt House) is located on Jodenbreestraat, and contains a collection of his works. Among the pieces displayed there are numerous biblical scenes, and several portraits of prominent seventeenth century Jews. A painting of an Ashkenazi synagogue in Amsterdam. Not far from the Rembrandthuis are several restored synagogues. A large complex houses the Great Shul (built in 1670), the Obbene Shul (1672), the Dritt Shul (1700) and the Neie Shul (1730); all four were badly damaged during WWII and its aftermath, and have recently been renovated. The shuls reflect the rapid growth of Dutch Ashkenazi Jewry in the seventeenth and eighteenth centuries – each synagogue was constructed when the previous one proved too small for the expanding community. The complex also contains a mikva and houses the Jewish Historical Museum, which has a large collection of memorabilia and ritual objects. Around the corner, on Plantage Middenlaan, is the Hollandsche Schouwberg. The spot was once the site of Jewish dramatic performances; later, it was the gathering spot for Jews who were rounded up and deported by the Nazis. A Holocaust memorial stands there today. The Beth Chayim Sephardi cemetery, which dates back to 1614. The “Snoga,” the Sephardi synagogue that has been in almost continual use since 1672, stands nearby. It is famous for its magnificent interior, its sand covered floors, and its library, which contains priceless copies of some of the scholarly works that made Amsterdam famous during the Golden Age. Down the road, on Waterlooplein, is the site where the previous Sephardi shul stood, in which Baruch Spinoza was excommunicated. The house he grew up in is nearby as well, and today houses a church. The Anne Frank House, at Prinsengracht 263, is one of the most visited sites in all of the Netherlands. The small house in which the Frank and Van Damm families hid for two years today houses a museum. Much of the house, however, has not been changed from its original state: posters of movie stars still hang on the wall of what was Anne's bedroom, and the kitchen walls are marked with pencil lines where the family marked their children's growth spurts. The government of Amsterdam announced on May 23, 2016, that they would be compensating the city's Jewish community to the tune of $11 million, to make up for taxes imposed on Holocaust survivors returning to the city following World War II. Survivors were forced to pay taxes as well as insurance fees when they returned, on homes left vacant after the owners were forcibly taken away by the Nazis. Amsterdam's government decided to give the money to the Jewish community because finding the individual people or relatives entitled to compensation would be too long and arduous a process. The seat of the Dutch government is less cosmopolitan than Amsterdam, but it too contains important history. Many Jews lived, and still live, in this city, most notably Baruch Spinoza during the last years of his life. There are several museums located in the houses he occupied, which are run by the Spinoza Society. Additionally, his grave is located in the Churchyard of the Nieuwe Kirk (New Church). While his excommunication prevented him from being buried in a Jewish cemetery, a memorial adorned with the Hebrew word “amcha” (“your people”) was placed on the site in 1956 by the Israel Spinoza Society, on the 300th anniversary of his excommunication. Also in the Hague is a Jewish Community center, and several synagogues. The most popular attraction in the city is the Madurodam, a miniature city on a 1:25 scale in which cars and busses move, windmills turn, and music and lights go on and off. The model was built by the Maduro family in memory of George Maduro, a Jewish military hero who died in Dachau. Middelburg was one of the first cities in the Netherlands where Jews could express their religion freely. 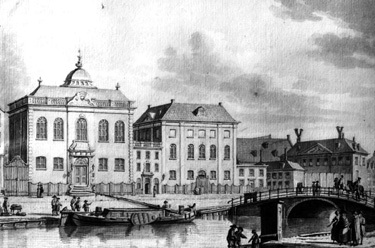 The synagogue in Middelburg was founded in 1705 and was the first synagogue to be built outside of Amsterdam. During the Holocaust, Middelburg's small Jewish community of 200 was first transported to Amsterdam in 1942 and from there was sent to concentration camps in Eastern Europe. The Germans used the synagogue as a storehouse during the war and the building was later severely damaged during the liberation of 1944. Only six of Middelburg's Jews returned to the city after the war. Without a Jewish community, Middelburg's synagogue fell into decay and by 1980, only a few walls remained intact. In 1987, the Stichting Synagoge Middelburg, the Middelburg Synagogue Foundation, was formed to undertake the resoration of the synagogue. The restoration was completed in 1994 and it is now possible to go visit one of the oldest surviving synagogues in the Netherlands between March and November, every Thursday from 10:00 untill 4:00. Middleburg is also home to two Jewish cemeteries, one Ashkenazi and the other Sephardic. The Ashkenazi cemetery dates back to 1705 and is still in use today. The Sephardic cemetery was in use between 1655 and 1721 and was recently restored. Rabbi Menasseh Ben Israel's son Samuel is buried at this cemetery. Ben Israel petitioned Oliver Cromwell in 1655 to allow the re-entrance of Jews to England and is believed to be partially responsible for Cromwell's decision in favor of their re-admittance. Both of Middelburg's Jewish cemeteries have been recognized as national monuments. GENERAL AND HISTORICAL: Brugmans-Frank; M.H. Gans, Memorboeck (1971); ESN; Graetz, Hist, index; J. Michman (ed. ), Dutch Jewish History (1982–), 3 vols. (as of 2006); S. Seeligman, De Emancipatie der Joden in Nederland (1918); S. van Praag, De West-Joden en hun letterkunde (1926); H. Poppers, De Joden in Overijssel (1926); E. Boekman, Demografie van de Joden in Nederland (1936); H.I. Bloom, Economic Activities of the Jews of Amsterdam in the Seventeenth and Eighteenth Centuries (1937, repr. 1969); H. Beem, De verdwenen mediene (1950); J. Stengers, Les juifs dans les Pays-Bas au moyen âge (1950); J. Melkman, David Franco Mendes (1951); D. Cohen, Zwervend en dolend (1955); M.E. Bolle, De opheffing van de autonomie der kehilloth (Joodse gemeenten) in Nederland, 1796 (1960); L. Finkelstein (ed. ), The Jews, 2 vols. (19603), index; J. Meijer, Het Jonas Daniël Meijerplein (1961); idem, Erfenis der emancipatie: het Nederlandse Jodendom in de eerste helft van de 19e eeuw (1963); idem, Zij lieten hun sporen achter (1964); I. Lipschits, Honderd jaar het Nieuw Israëlietisch Weekblad, 1865–1965 (1966); C. Reijnders, Van "Joodsche natiën? tot Joodse Nederlanders (1969); Shunami, Bibl, index. HOLOCAUST PERIOD: W. Warmbrunn, The Dutch under German Occupation 1940–1945 (1963); R. Hilberg, Destruction of the European Jews (1961), 365–81; J. Presser, Destruction of the Dutch Jews (1969); idem, Ondergang, 2 vols. (1965); A.J. Herzberg, Kroniek der Jodenvervolging (1949–54); De Jong, in: Yad Vashem Studies, 7 (1968), 39–55; P. Mechanicus, In Depot, Dagboek uit Westerbork (1964); H.G. Adler, Theresienstadt (Ger., 1960); E. Kolb, Bergen-Belsen (Ger., 1962). CONTEMPORARY PERIOD: JJSO, 3 (1961), 195–242; 4 (1962), 47–71; H. Boas, ibid., 5 (1963), 55–83; J. Melkman, Geliefde vijand (1964); M. Snijders, Joden van Amsterdam (1958); S. Wijnberg, De Joden in Amsterdam (1967); A. Vedder et al., De Joden in Nederland na de tweede wereldoorlog (1960). ADD. BIBLIOGRAPHY: Studia Rosenthaliana, 1–76 (1967–2005); M.H. Gans, Memorbook (1977); J. Michman (ed. ), Dutch Jewish History, vols. 1–3 (1984–93); B. Moore, Victims and Survivors (1997); J. Michman, H. Beem, and D. Michman, Pinkas. Geschiedenis van de joodse gemeenschap in Nederland (1999); Y. Kaplan and C. Brasz, Dutch Jews as Perceived by Themselves and Others (2001); J.Ch Blom, R.G. Fuks-Mansfeld, and I. Schöffer (eds. ), The History of the Jews in The Netherlands (2002); J. Michman and B.J. Flam, Encyclopedia of the Righteous Among the Nations: The Netherlands, 2 vols. (2004). Maurice Hirsch, Adv. and Nan Jacques Zilberdik, “Following PMW lecture, Dutch parliament passes motion to cut funding to PA,” Palestinian Media Watch, (December 17, 2018). Photo Credits: Center for Research on Dutch Jewry, at the Hebrew University, Jerusalem. Ellen Land-Weber, from her book To Save a Life: Stories of Holocaust Rescue.